Trang Vegetarian Festival, Thailand - Has Anyone Been To...? We hadn’t really planned this bit of our trip that well. The previous legs, out to an island and into the rainforest, had required such a high degree of it we left these few days as simply ‘get to Malaysia’. So looking at where the buses went, and checking our guide book, we saw that Trang, a few hours down in the right direction had a Chinese Vegetarian Festival starting the next day. 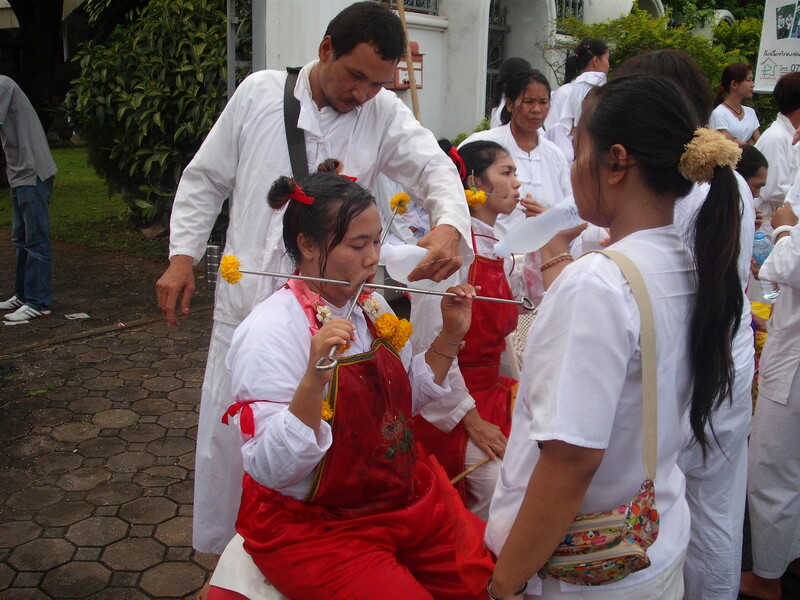 Rather than an English vegetarian festival, which would involve lots of vegan carrot cake and PETA stalls, this is a Chinese-Thai festival of the nine Emperor Gods, and requires vegetarianism, white clothing and celibacy for nine days. Oh, and possession by the Gods and self mutilation if you’re that way inclined. I had heard of this, but only in the tourist town of Phuket, and while Trang’s celebrations were reportedly smaller, indeed the guide book barely mentioned the town at all, it was en route and seemed foolish to skip it. It was one of the best decisions we made. Having got to our Hotel thanks to a tuk-tuk driver who seemed determined to get into town from the bus station using only pedestrian walkways, we set off for the Tourist Information centre, believing they’d have the most up-to-date information about where and when the festivities were happening. We found the street, the block and supposedly the door, but no Tourist Information appeared. We circled the area a few times before dejectedly getting out the map to see where else might be able to help. Just then a man stepped out of the supposed Tourist Information and asked if he could help at all. Was this in fact the worst sign-posted Information site we’d yet found? No. The TI had moved three years ago. This man was incredibly helpful though. Pleased that some tourists had come to Trang instead of Phuket, he took us inside, drew us a map to the new TI and called some of his Chinese-Thai colleagues in to pick their brains about what was happening in the next few days. Rejuvenated and with our new map we set off again to see if the TI could add anything else to our freshly acquired facts. It turns out the Thai Government aren’t too fussed about Chinese-Thai festivals. The staff knew very little other than the fact it was going on, and the two leaflets about it hadn’t been translated for foreigners. The lady at the desk just said that foreigners don’t come here for it, it’s not a tourist attraction. Whilst I’d love it to stay as we found it, two of only four white faces we saw in the whole three days in town, Trang is missing an opportunity there. Having found out from the vastly superior old TI that the main parade was tomorrow evening, but people would be wandering all around town for the full nine days, we decided the Chinese Temples would be a good place to start. We passed through the Chinese centre of the town, and every store and house had a table set up outside complete with nine bowls of rice nine cups of tea and decorated with flowers. When one of the nine Emperor Gods walked by, they would drink some tea, eat some rice and bless the house with the rest. The Chinese-Thais then analyse every aspect of their visits, from which God came first, to who ate most and where the blessed rice landed in order to predict their years fortune. 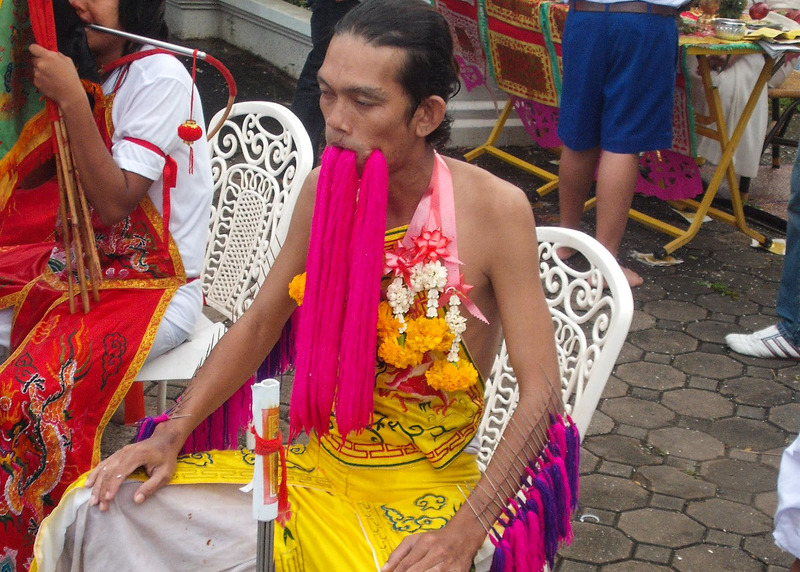 Of all the Emperor Gods we saw in Trang, one in particular stays with me. I confess I know little about the Gods, but this one was clearly a monkey. He wasn’t in a suit, he had no fake tail or ears, but everything about the way he moved and the way he used his staff screamed monkey. It was fascinating to watch him, and easy to see why people could believe he had been possessed. The picture to the right is him blessing our hotel. Up at the church it was heaving. The road into it had been lined with temporary stalls selling the most delicious vegetarian foods, offerings for the Gods and the white garments that everyone was wearing. These clothes gave the whole thing a rather dream like quality, as well as making everyone appear very devout, when you know many are as Taoist as most English people are Christian on Christmas Day. There were three huge incense sticks, though they resembled pillars more than sticks, smouldering at the back of the courtyard, making the whole area smell sickly sweet. Scattered amongst the brilliant white people were flashes of red and gold. These were the more sinister side of Godly possession, and were frankly terrifying. I find any kind of religious fervour unnerving, simply as it is something I struggle to understand, and shy away from even tame English celebrations. These people, predominantly men but with a few women here and there, claim to have been possessed, and in order to prove that they are no longer truly of their Earthly body, they mutilate and harm themselves in the most disturbing ways. Many walk around with skewers through their cheeks, on which those seeking good fortune place fruit as gifts. There are also lots of variations on this theme- a couple of daggers, a fishing rod, the extensive prow of a large model ship- but the ones I found most disturbing split into two categories. One group didn’t seem to harm themselves at all, although they were still covered in blood, but moved through the streets in a half dance, half march, with eyes rolling and speaking in strange voices. If it is an act, it is a unsettlingly convincing one. The other group were the ones who went all out for the harm, attacking sensitive parts of the body, such as sawing at their tongue with a hacksaw all day long. The amount of blood they are covered with is in itself distressing, but it’s their placid faces that seems so unnatural, as though they were doing nothing more taxing than watching a dramatic soap opera. Somewhat shaken, as well as impressed by the scale of it all, we retired for the night, ready for the next days big events. Having spent the day browsing the street markets, and the local craft hall, a government sponsored initiative attempting to give poor rural communities a forum to sell their wares through, we gathered by the town clock as it got dark and joined the curious Thais watching from the side-lines. 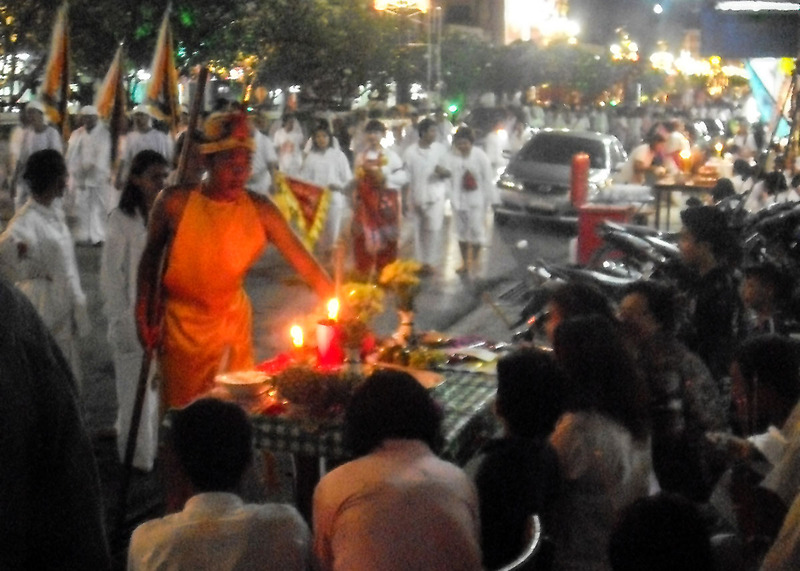 There were thousands of people there, all wearing white, as well as thousands of firecrackers. These were wrapped thickly around 15ft poles that were held aloft in a circle waiting for something. In the meantime, the chanting never stopped. It was hypnotic and utterly beautiful. Soon a procession approached, consisting of models of the nine Emperors in thrones and their bodyguards. These were parading around the circle before the firecrackers were set off, causing the Emperors to rock wildly in their thrones. From what I could gather from those around me, this ceremony is designed to scare the Emperors from returning to our world. They celebrate the nine day that they are half here, whilst giving them this warning not to return fully and permanently. There then followed another beautiful, sedate song, with all the worshippers lining up with candles to receive a blessing. Compared with the raucous noise from the firecrackers, it was hard to believe that this was the same festival. It was with a heavy heart that we acknowledged our pressing deadline to get to Kuala Lumpur and caught a bus to Hat Yai the next morning. However, our sadness was proved unnecessary, as it turns out Hat Yai also celebrates this festival in style- why this is not mentioned in guide book I can’t imagine. There were stalls of food everywhere, parades through the whole city and a real carnival atmosphere to this overlooked place. This is a festival that will shock you as much as it will impress you. It is celebrated throughout South East Asia, but primarily in Thailand, where it was supposedly started by a passing travelling circus in Phuket in 1825, when turning to a vegetarian diet cured them of some unnamed malady.